2017 has arrived. Let the polymer clay fun begin! To help kick off this WIP Wednesday, since we’re only a few days into the new year, I’m going to show you a few things I’m working on; as well as some great supplies you might like in your studio for the new year. I will also let you know where you can find these supplies. (PS: Most of my supplies I get from Amazon as my nearest retail art/craft store is about an hour and a half from my house. — Yes, I live in podunk). Since we are only 4 days into January there isn’t a whole lot of new “art” I can show you for this WIP Wednesday yet. So I’m going to take this opportunity to walk you through a few products and things I’m using right now in my studio. It’s the winter season right now and that means I’m making a LOT of wintery themed items. That also means that my jar of Perfect Pearls in “Pearl” is staying on my work surface about 90% of the time. Yes, even me who cleans up my work surface constantly. There are lots of sets out there, but this basic metallic set has two of my favorites: pearl & bronze. Need “snow” to put on your items after they are baked? Make your own using heavy gesso, glass microbeads in whatever color you choose (I use white), and Stampendous Shaved Ice. Notice that nice ball of white clay? Yeah, I give tips for keeping white clay white in both the Angel Doll & Polar Bear tutorials, but what you should really notice is my new work wedding ring. It’s silicone! So I can get all kinds of paints, products, and goop on this in my studio and never ruin it. Here’s my ring from Qalo [not an affiliate link]. My hubby & I both got Qalo rings for Christmas this year. Chalk pastels. There are few things in my studio that I love more. Be wary however because not all chalk pastels are created equal. Some (while having a nice low price tag) also have horrible pigments and are not vibrant at all. This picture is actually of a student set I bought to try out. They are not that good. I have my go to Inkadinkado set that is several years old that I love and adore. But one stick form that I also highly recommend is this set from Mungyo. It’s fabulous and richly pigmented and a FANTASTIC price too! Fountain Pen Stuff. And just because we all need to highlight our “hobbies…” One of my hobbies is fountain pens. From pens, inks, and the fancy paper to write with them. This was some of my ‘hobby loot’ that Santa was so kind to bring me this year. Restash that clay box! 2017 has just kicked off, if you haven’t done this yet, you need to. Restash that polymer clay box. There’s a lot of new projects, goals, and tutorials you are going to want to tackle this year and it helps to have a nicely sorted clay box to get the year started in a good direction. One of my favorite things to use in my work is vintage stones. These are from my friend Brenda at B’Sue Boutiques. She’s got some great brass, stampings, supplies, and now even pewter! Make sure you go check her out for unique pieces you can make with polymer. Last but not least … some days, napping in the studio is a good idea. Right?! Join the 2017 Polymer Clay Challenge. 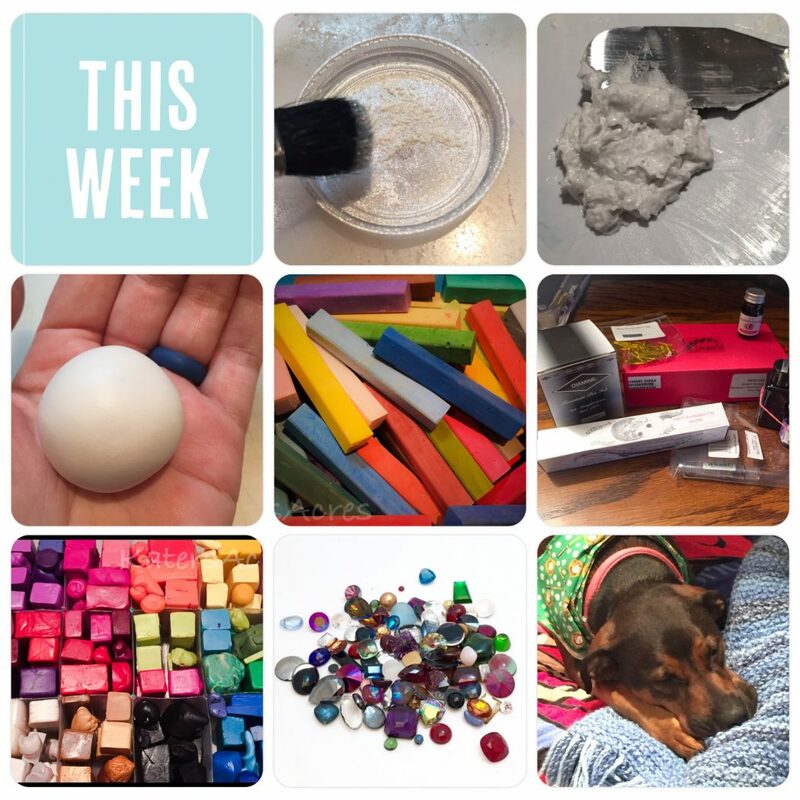 See what’s new every morning with Polymer Clay Daily. The long awaited Polymer Clay Adventure for 2017 has launched! Join me FRIDAY for our first giveaway of the year. It’s going to be a BIG one! Stay tuned. As I’m just getting back into working with clay, I’m having to see what I have at hand before adding to my stash. I love using old buttons for designs or making molds and as I also sew there are always buttons to be had including some from my mom and grandmother. I LOVE finding old buttons to use as molds. The older the button the great the design and the more charm too. Right now for me it’s Liquitex Basics for shading and inka golds for highlighting. I made my mom a picture frame for Christmas that I thought turned out really well so I am trying the same on a box.